If you’re looking to establish a logistics hub on the West Coast, California makes practical sense. Its ports and transportation infrastructure, as well as its economic and population advantages, make the state one of the world’s foremost logistics centers. But doing business here requires an understanding of the state’s unique regulatory environment. In this article, we will examine some of these regulatory hurdles and provide you with information to navigate them effectively. If you’re an actor, California is where you go to “make it” in the movie business. If you’re in the (only slightly) less glamorous business of logistics, the same applies. California is a choice distribution spot for businesses that import goods via the state’s ports or need to distribute to the huge West Coast consumer markets. California is the 5th largest economy in the world. The state of California’s gross domestic product is now $2.7 trillion, which surpasses the entire UK. California has the highest-volume ports in the U.S. More goods flow in and out of the Ports of Los Angeles and Long Beach (ranked #1 and #2 respectively) than any other port in the U.S. Not to be forgotten, the Port of Oakland is the 8th-busiest port in the U.S. A CA distribution center allows you to move imported goods quickly from port to shelf and shrink your cash cycle. California’s border with Mexico allows for fast distribution of Mexican-manufactured goods. Products can be shipped quickly from Mexico to California for immediate distribution. California enables fast, efficient distribution to the Western U.S. From California warehouses, companies can reach 17 percent of the U.S. population within one business day. California has a large available workforce. It needs it. 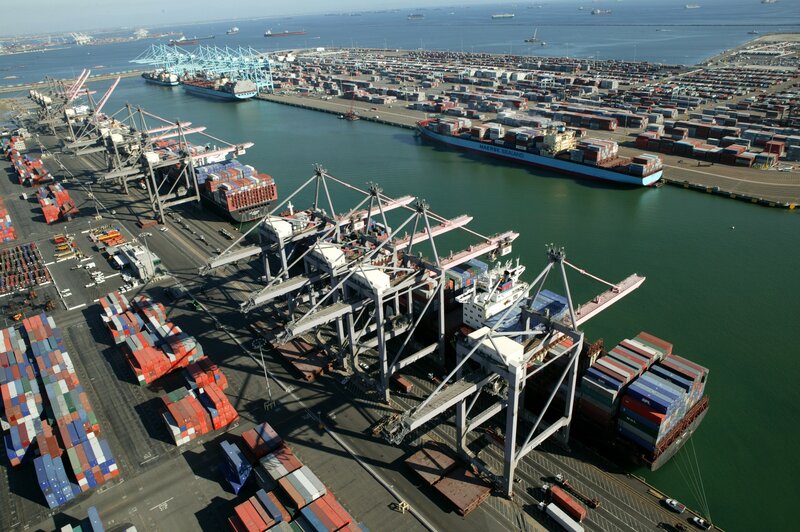 According to the Port of Los Angeles, the combined Ports of LA and Long Beach create 992,000 jobs in the five-county region of Southern California. That’s one in every nine available jobs! Takeaway: California regulations may be stricter than you’ll find elsewhere. To capitalize on the state’s many logistical advantages, you simply need to understand relevant laws and regulations to stay compliant. To help you do this, the following sections outline regulations that impact three main logistics functions: port operations, warehousing and trucking. Navigating California ports involves much more than selecting the right port for your operation. It means treading carefully when hiring a drayage carrier and ensuring that your operation’s drayage trucks are compliant with state regulations. For many years, the Teamsters and other state labor leaders have argued that trucking companies have classified drivers – particularly drayage drivers – as independent owner/operators when they really act more like dedicated employees. The motive, they say, is to avoid the cost of providing a full benefits package. The battle reached the state Supreme Court, which ruled that transportation workers (and certain other groups of workers) should be presumed to be employees, and not independent owner-operators, when class action cases are reviewed. In the ruling, they applied a new, more stringent, set of criteria that hiring companies must meet in order to treat drivers as independent owner-operators. Into this contentious landscape came, in 2018, California Senate Bill 1402 (S.B. 1402). Under this law, beneficial cargo owners (BCOs) who work with drayage companies that have been found to mis-classify drivers will be held jointly liable for wages and damages owed by the drayage providers to its drivers. In January 2019, a drayage company operating at the Ports of Los Angeles and Long Beach was found liable for misclassifying drivers as independent owner/operators instead of employees. As a result, 24 port drivers were awarded almost $6 million in unpaid wages and expenses by the California Labor Commissioner. A general manager who oversaw day-to-day operations was found to be jointly liable. This finding further raises the tally of wages and expenses awarded to misclassified port drivers. As of September 2018, more than $48 million had been awarded to 987 drivers who filed suits citing misclassification and wage theft. Takeaway: You, or your 3PL partner, need to ensure that any trucker you hire for drayage freight services is compliant with California laws on driver classification. By working with a dray provider that employs its own driver force, you avoid the risks outlined above. In addition to the port drivers, California regulatory reach extends to the drayage trucks themselves. As of October 1, 2018, the Ports of Los Angeles and Long Beach require all trucks registering for the first time with the Port Drayage Truck Registry (PDTR) to be model year 2014 and newer. Trucks registered prior to this date can continue operations as usual (though all trucks operating at the ports are required to be model year 2007 or newer). All trucks that operate within these ports must be registered with the PDTR. This regulation was created in accordance with the San Pedro Bay Ports Clean Air Action Plan (CAAP) – a coordinated effort between the Ports of L.A. and Long Beach to improve air quality. CAAP’s stated goal is to transition to zero-emission trucks by the year 2035. Takeaway: Ensure that the trucks your drayage operation uses comply with CAAP (if using the Ports of L.A. and Long Beach) and CARB regulations. Heavy trucks and buses (those with a GVWR greater than or equal to 26,000 lbs) must have 2010-or-newer model-year engines by January 1, 2023. Until that time, some engines that are older than model year 2010 can comply with the Truck and Bus Regulation if they are fitted with a Diesel Particulate Filter (DPF), which is used to reduce diesel emissions. There are a few exceptions for trucks that only rarely operate within California. Non-compliant trucks that limit their miles within California to less than 1,000 in a calendar year may qualify for CARB’s “low-use exemption.” Additionally, non-compliant trucks may apply for a “three-day pass” with CARB. This pass allows a single non-compliant truck to operate within California for three days out of a single calendar year. Takeaway: All trucks that regularly operate within the state of California must comply with the Truck and Bus Regulation and be registered with CARB’s Truck Regulation Upload, Compliance, and Reporting System (TRUCRS) system. Make sure your business is working with a California trucking company that's up to code. Diesel-fueled transportation refrigerated units (TRUs) that are installed on trucks must meet an additional set of CARB requirements. In short, TRUs are required to comply with Ultra-Low-Emission TRU (ULETRU) standards within 7 years of the model year date. So, a 2009 TRU, for example, needed to comply with ULETRU by January 1, 2016. As with heavy trucks, TRUs can be fitted with diesel particulate filters (DPF) to reduce emissions before a new unit is required. There are additional regulations related to runoff and water drainage for facilities that fuel trucks and/or have mechanic shops on site. If there is runoff from such a site that can go into storm drains, the runoff needs to be tested. If there is too much fuel or oil residue coming into the storm drain, the owner of the facility can be fined or forced to alter the parking or work areas so that fuel can be captured and taken to a recycling plant. Discharges into public water systems are regulated under California’s Porter-Cologne Act. In a November 2018 settlement with the EPA, a national trucking company was penalized $125,000 for operating 150 non-CARB-compliant trucks in California between 2013 and 2016 and for failing to verify compliance among 1,200 carriers it hired within the state. In addition to the penalty, it will also spend $350,000 on air filtration projects at L.A. area schools located near freeways. Also in November 2018, another national trucking company settled for similar infractions with a $100,000 penalty and commitment to a $225,000 air filtration project at L.A.-area schools. In April 2018, the EPA announced settlements with three trucking companies for failing to comply with CARB regulations. These settlements included a combined $201,000 in penalties. Takeaway: With high truck density comes related concerns over air quality and the health of local residents. California’s aggressive regulatory response is proportionate to the need and concern. Businesses that choose to operate here are better to view state regulators as partners, not anti-business bureaucrats. Injury and illness prevention – Cal/OSHA mandates that every employer creates – and then follows – a written injury and Illness Prevention Program (IIPP) specific to its facilities and the type of work being performed. Failure to adhere to IIPPs is Cal/OSHA’s most common citation. Air contaminant exposure – Cal/OSHA often sets Permissible Exposure Limits (PELs) for air contaminants that are stricter than the federal limits. The federal PEL for acetone, for example, is 1,000 parts per million (ppm), whereas the California PEL is 500 ppm. Heat exposure – Heat is a big issue for logistics in California. As such, the state’s labor laws dictate that if the working environment - whether inside or outside (e.g., within ocean containers) - reaches 110 degrees, employees must be given an hour break every three hours to cool off. Takeaway: Cal/OSHA compliance must be taken very seriously, as fines for non-compliance can be as high as $126,000 per violation. Wages – In California, the minimum wage is higher than in most states. It’s currently $10.50/hr and is expected to rise to $15/hr by July 2022. “Piece rate” wage laws are also different in California, where employees must not only be paid for their productive time, they must also be paid at least minimum wage for breaks and other non-productive time. Meal breaks – California has a “meal break law” which stipulates that employees who work 5+ hours must have a 30-minute meal break. Importantly, 30 minutes means 30 minutes and not a minute less. Similar to other states, a 10-minute “rest break” is also mandatory for every 4 hours worked. Companies that violate these laws pay an employee an extra hour of regular pay for each day that a full break was not given. Importantly, these laws – as with many Cal/OSHA regulations – extend beyond warehouse labor management and apply to drivers and other types of employees within the state. Lawsuit judgments and penalties can be enforced retroactively. Using meal and rest break laws as an example, there have been lawsuits in which offending companies have had to pay penalties for thousands of employees for offenses dating back several years. Non-compliance with labor regulations carry financial penalties. The following are just a few examples. In 2014, a dedicated warehousing provider for a top retailer – along with the retailer itself (listed as a co-defendant) – agreed to settle a suit brought by 1,800 warehouse workers. The settlement resulted in a $21 million payment to the workers who claimed multiple wage and labor violations, including unpaid overtime and illegal piece-rate wages. A California logistics company, along with staffing companies it hired, agreed to pay up to $1.9 million in the face of a proposed class action suit. Warehouse workers claimed that these companies together violated the state’s minimum wage law, as well as other statutes. A California warehousing company specializing in distribution for major retailers is facing a class action suit from 1,500 California workers who worked for the company between 2009 and 2016. Among the violations cited, the plaintiffs claim that they were denied meal breaks and overtime pay. Takeaway: You may have the best HR team on the planet, but if it’s not well versed in California laws and regulations, then you need to work with someone who is. If you’re driving on California’s Pacific Coast Highway, you need to be mindful – of the winding roads that hug steep cliffs; of occasional flooding; and of the fog that can impede visibility early in the day. But these are not good reasons to avoid taking one of the most breathtakingly scenic car rides in the world. So it is with operating a logistics hub in California. The benefits far outweigh the regulatory downside. You just need to be prepared. What does prepared look like? It means having the right equipment and managing your workforce with people who fully understand the state’s laws and regulations to ensure compliance. It also can mean handing all or parts of your operation over to local 3PLs that already have the expertise and equipment in place. The “build or buy” decision is yours. Either way, you’re in California – a pretty nice place to live and work. © 2019 Weber Logistics, all rights reserved.